Broccoli belongs to a family of vegetables called cruciferous vegetables and its close relatives include Brussels sprouts, cauliflower, and cabbage, kale, bok choy, collard greens, rutabaga, and turnips. These nutrition powerhouses supply loads of nutrients for little calories. Broccoli has its roots in Italy, broccoli is an all-star food with many health benefits. While low in calories, broccoli is rich in essential vitamins and minerals, in addition to fiber. 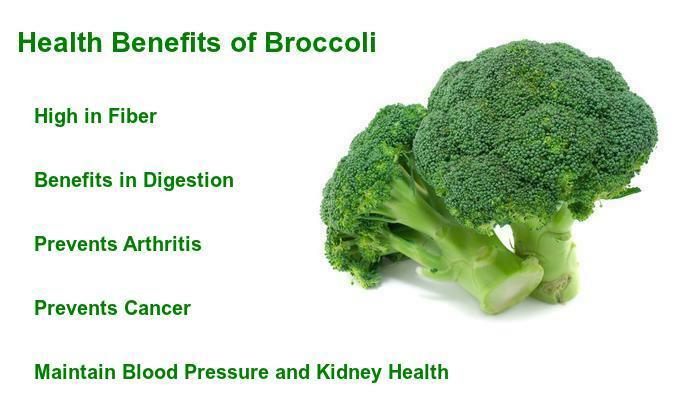 Let’s see some of the amazing health benefits of Broccoli. Broccoli is one of the most popular vegetables all over the world and it is used in a variety of dishes and cuisines. It has been a staple in bodybuilding diets for obvious reasons: it’s low carb, rich in fiber and antioxidants. High-volume, low-calorie foods like broccoli and cabbage are typically withheld from muscle-building diets as they can cause the early onset of satiety and fullness, which makes hitting a high-calorie target harder. Broccoli, contain several unique antioxidants and compounds that can help to improve your health in a variety of different ways. Indole-3-carbinol and D-glucaric acid are two other nutrients found in cruciferous vegetables that aid in clearing excessive estrogen and toxins from your body. They clear excess and chemically similar estrogens and allows you to minimize the negative effects of estrogen on your muscle-building goals. Broccoli contains as much calcium as a glass of milk. Calcium helps to keep you heart beating regularly and promotes sleep. Also, it contains more vitamin C than an orange. Vitamin C is great for your hair, skin, teeth, fighting infections and keeping red blood cells healthy. Its not that broccoli is only eaten by bodybuilders, its just that it has many benefits if you eat. Eaten raw, broccoli has a number of nutritional elements. It’s important to note that broccoli is best when eaten raw, because cooking and processing destroys some of its antioxidants. Health Benefits of Broccoli: It’s reputed to benefit digestion, the cardiovascular system, and the immune system, and to have anti-inflammatory and even cancer-preventing properties. It gives huge benefits in digestion. It also helps in curing Arthritis, as it’s thought that increasing broccoli in your diet may help to slow down and even prevent osteoarthritis. It has also been shown to kill cancer stem cells. It contains glucoraphanin, which with the body processes into the anti-cancer compound sulforaphane. This compound rids the body of H. pylori, a bacterium found to highly increase the risk of gastric cancer. Broccoli may also significantly improve your blood pressure and kidney function.